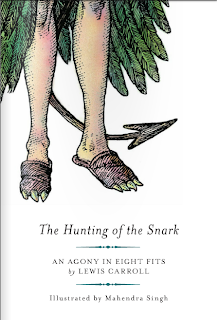 Here is a newish illustrated edition of Lewis Carroll's poem The Hunting of the Snark from the entertaining and enterprising publisher Melville House Books. The book is illustrated by Mahendra Singh (more examples of his Snark art here). 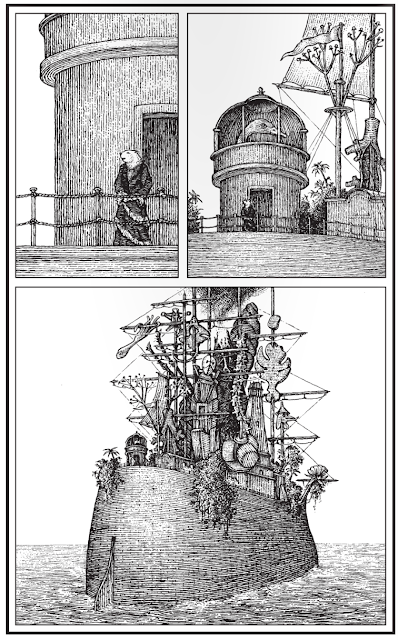 Although Lewis Carroll is more famous for the Alice books the Hunting of the Snark has generated a whole industry of speculations about what it means. The mathematician Martin Gardner published an annotated version of the poem in 1974. Lewis Carroll was also known as Charles Lutwidge Dodgson. I was walking on a hillside, alone, one bright summer day, when suddenly there came into my head one line of verse – one solitary line – "For the Snark was a Boojum, you see." I knew not what it meant, then: I know not what it means, now; but I wrote it down: and, sometime afterwards, the rest of the stanza occurred to me, that being its last line: and so by degrees, at odd moments during the next year or two, the rest of the poem pieced itself together, that being its last stanza. Sometimes good comes through adversity.